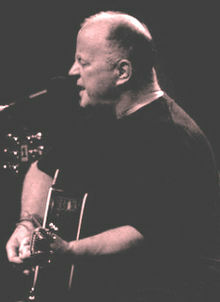 Christy Moore in the Royal Liverpool Philharmonic, October 2008. Christy (1995) 54 mins – Christy reflects on life and career. Christy Moore Uncovered (2001) 104 mins – features collaborations with Jimmy MacCarthy, Wally Page, Shane MacGowan, Sinéad O'Connor and John Spillane. Live 2004 (Planxty DVD) The reunion of the hugely popular and influential group after a 20-year hiatus. Christy Moore's Come All You Dreamers – Live at Barrowland (2009) – Filmed in Barrowland in Glasgow featuring Declan Sinnott. ^ "Rehab Press Room". Archived from the original on 30 April 2008. Retrieved 22 September 2008. ^ a b c d e Moore, Christy (2000). One Voice. London: Lir/Hodder and Stoughton. ISBN 0-340-76839-8. ^ "Listen Its Christy Moore". Irish Music Magazine. 30 March 2009. Retrieved 18 April 2009. ^ "Christy Moore – Music Charts". Acharts.us. Retrieved 16 November 2017. ^ "ElectionsIreland.org: 19th Dail – Kildare First Preference Votes". Electionsireland.org. Retrieved 16 November 2017. ^ – 15:00 (17 June 2007). "Desert Island Discs – Castaway : Christy Moore". BBC. Retrieved 17 April 2012. ^ "The story of Christy Moore and the Stardust song". The Dublin People: Northside East. 2 February 2016. Retrieved 27 January 2018. ^ Moore, Christy (2003). "One Voice"p.168. Hodder and Stoughton.London. ^ "Christy Moore". 26 October 2008. Archived from the original on 28 July 2012. Retrieved 17 April 2009. ^ Melia, Paul (22 October 2004). "Christy Moore 'frightened' by detention at Holyhead". The Irish Independent. Retrieved 22 October 2009. ^ "Irish singer's port quiz anger". BBC. 22 October 2004. Retrieved 22 October 2009. ^ "Irish singer Christie Moore was questioned by the British authorities – Irish Music Daily". Irishmusicdaily.com. Retrieved 16 November 2017. ^ "BBC Radio 4 Desert Island Discs". BBC. 17 June 2007. Retrieved 17 June 2007. ^ "IRMA – Irish Charts". Irish Recorded Music Association. Retrieved 25 November 2017. 4711ers.org '4711' is a term Christy coined which refers to his online fanbase.